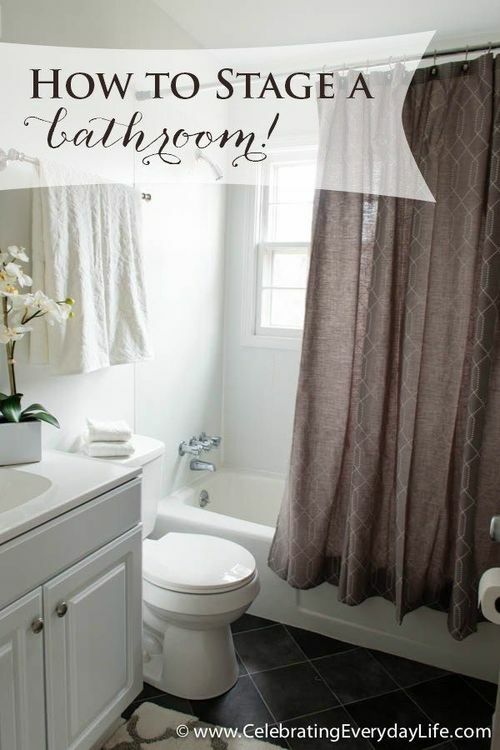 Did you check out the how to stage a bedroom post?Today we’re chatting about staging a bathroom. Like the bedroom, less is definitely MORE in here.In this first bathroom, I found these white damask towels and loved them. I know they are a great neutral that I’ll be able to use in many more bathrooms that I stage.But, since the bathroom itself is mostly white, with the exception of the pretty floor, I wanted to add a little bit of drama.This dark grey curtain hits just the right note – especially since this shower/tub combo has a window in it.Otherwise, the shower curtain might have overwhelmed this petite space.Home Staging Before + After, Home staging ideas, How to stage a bathroom, decorate a bathroom for sale, how to decorate a bathroom, celebrating everyday life with Jennifer carroll. An orchid in a sleek modern container lends a bit of “life” to the space (even though it’s faux!) and a hand soap and lotion duo tucked in a chrome carrier add a bit of hotel posh to the vanity.